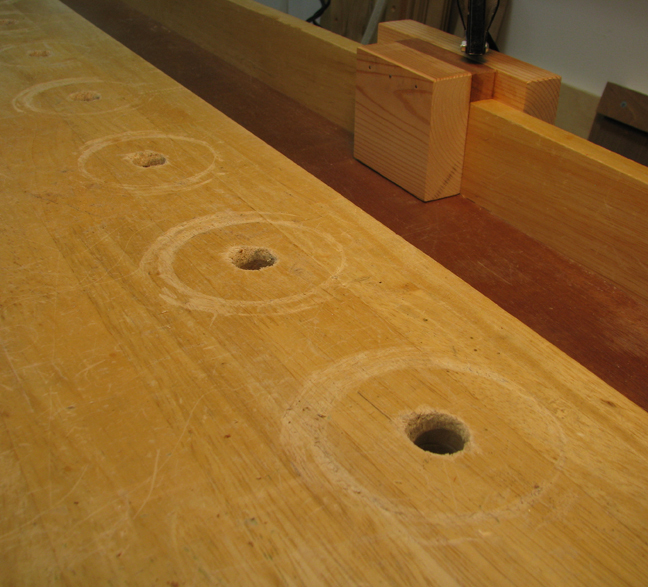 You might wonder why there are circular troughs surrounding each of the bench holes on my workbench. They are the result of me swinging the arm of my desk lamp around as the light needs to be shifted. The plastic clamp portion of the lamp had broken long ago and I am too frugal to buy another, so I just stick the metal post in a bench hole and get to work. Over the years, the metal post has begun eating away at the holes, so the desk lamp has become less supported and refuses to stand upright. Today, I had had enough and decided to build a quickie holder that could slide along the back edge of my bench. I figured it would keep me from my project for about half an hour. More than an hour later and with much fiddling, I'd come up with a lego-like contraption that works, but is rather unsightly. I sandwiched a spacer block between two 2x4s and stuck the lamp post in a hole that I drilled into one of the boards. 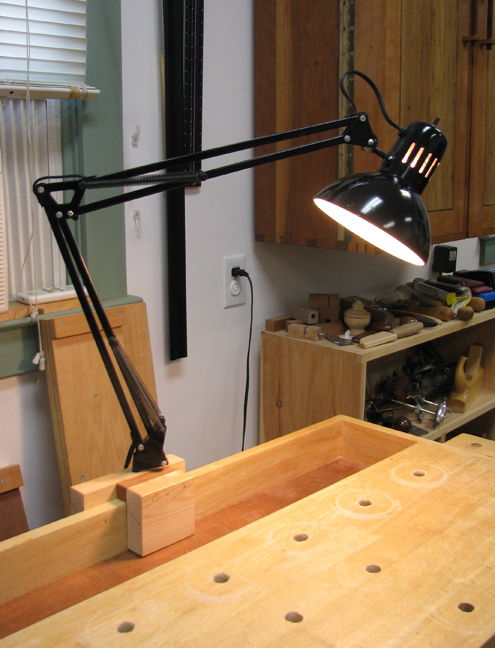 When I angled the lamp to one side to test it, the entire assembly tipped along with it. 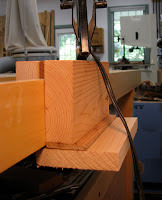 That meant adding another piece that would wrap beneath the back edge of my bench, but the 2x4 in the back was too short to reach the bottom of the apron. 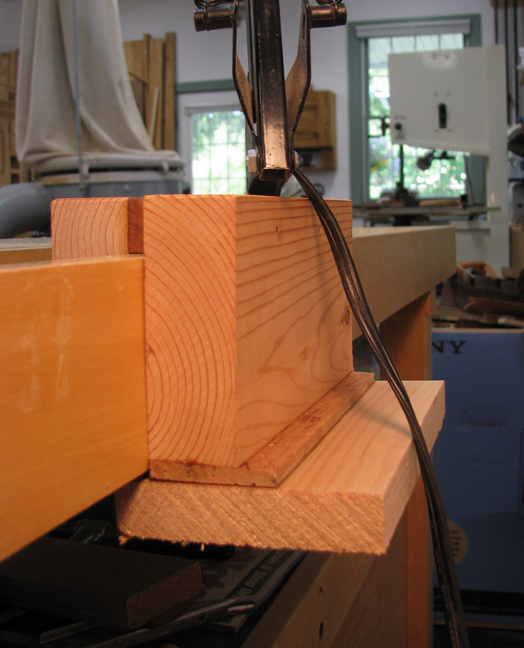 So, I had to add another thin board beneath the 2x4 before adding the final piece that would hook the holder in place. It's pretty ugly. But it does work. Which reminds me of another "There, I fixed it!" story. Our garden hose had started to leak pretty badly where the nozzle is attached, so I went to the store to buy plumber's tape. 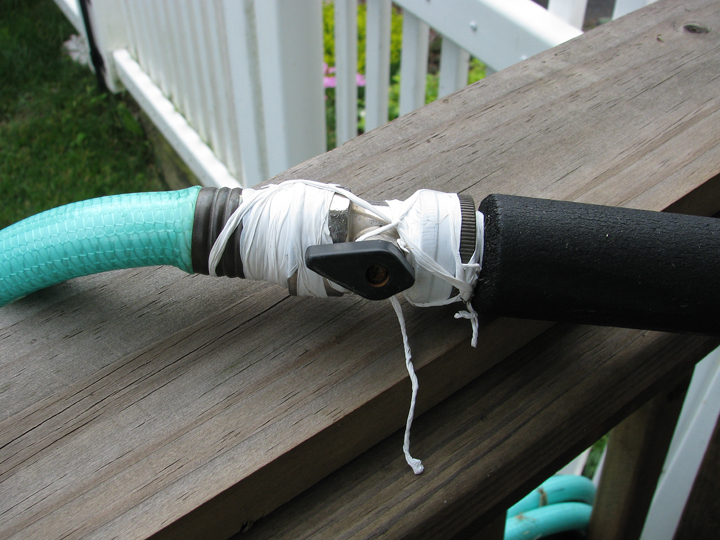 I did not fix it right away, a few hours went by, and my partner came in from the yard to tell me she'd fixed the hose. She then proclaimed, "That tape is so lame. It's not even sticky!" I kinda wished she had asked me how to use plumber's tape before she fixed our leaky garden hose.